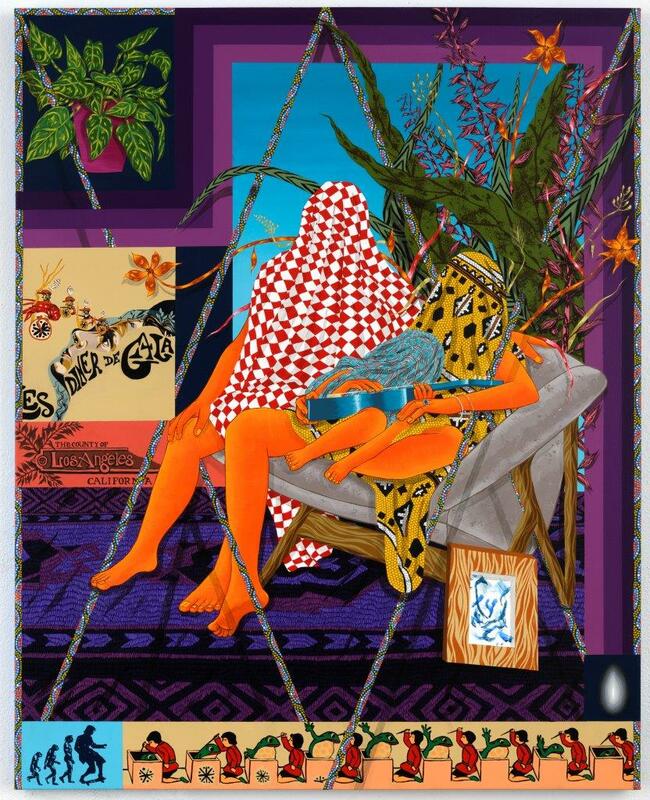 Amir H. Fallah's paintings introduce a search for identity and a possible sense of belonging. 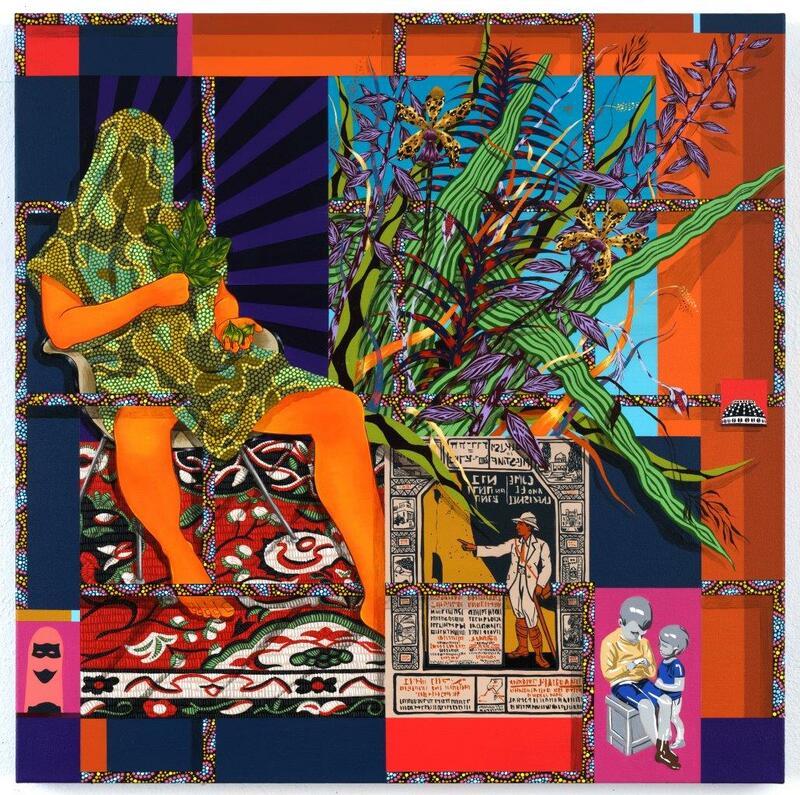 An American artist based in Los Angeles, born to parents who came to the US from Iran in the wake of the Iranian Revolution of 1978, he grew up in a family-oriented setting deeply rooted in Iranian culture, and at the same time—with the expectation and need to adopt American culture and assimilate in it. This duality gave rise to an artistic practice that oscillates between cultures, representing a state of perpetual limbo. In his new exhibition "A Hybrid Heart" at Gordon Gallery—a continuation of his previous show in 2017—he presents portraits rife with detail, featuring families and subjects "caught" between two worlds. The multiple objects engulfing the figures carry clues and insights regarding their nature and identity, forming the paintings' focal point. Fallah works from photographs which he stages and subsequently processes in Photoshop. Based on these, he creates large-scale portraits whose style ranges from realism to pop art, creating surfaces of spectacularly colorful shapes and patterns. In all the works, the figures' faces—whether women, men, or children—are invisible, covered with an eternal veil. They become an integral part of the excess of textiles and trendy clothes combined with fabrics and various accessories, such as ties, watches, gloves, bags, and jewelry. Into all these he weaves ornamental geometric and floral designs to spawn an overflowing, highly detailed painterly array, bathed in disconcerting, restless beauty. Hans Holbein the Younger's quintessential Renaissance portrait, The Ambassadors (1533), features two dignitaries bedecked in extravagant garb, surrounded by meticulously rendered objects, including musical instruments, navigation devices, books, oriental fabric, and jewelry. Holbein revels in the materiality of the textures and the beauty of the objects which signify the power, knowledge, and wealth reserved to the European elite of his time. All these are disrupted by an anamorphic, distorted skull hovering at their feet, reminding them and us that we are ephemeral. 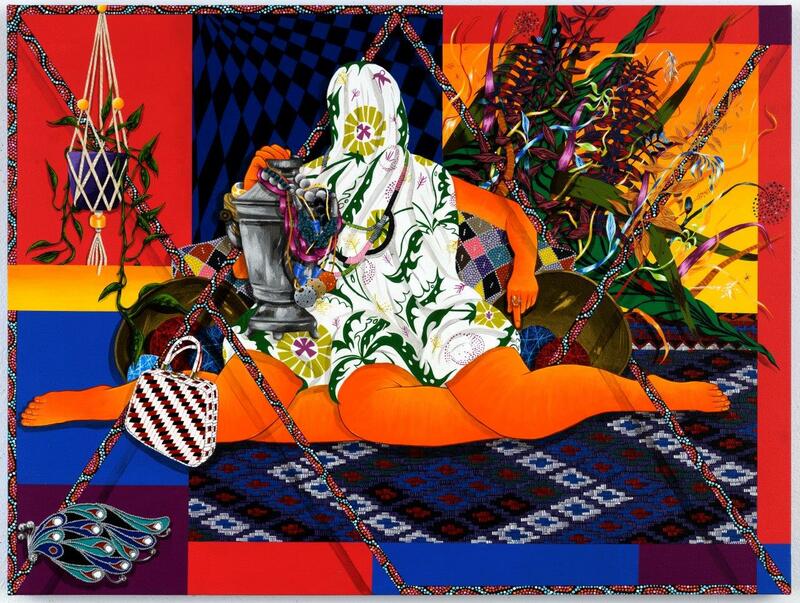 In Fallah's work, it is the fabric-covered faces that undermine the delight with the colors and materiality, as the yearning to see the other person’s face is unfulfilled, thus introducing a sense of uncertainty, fear, and even threat. 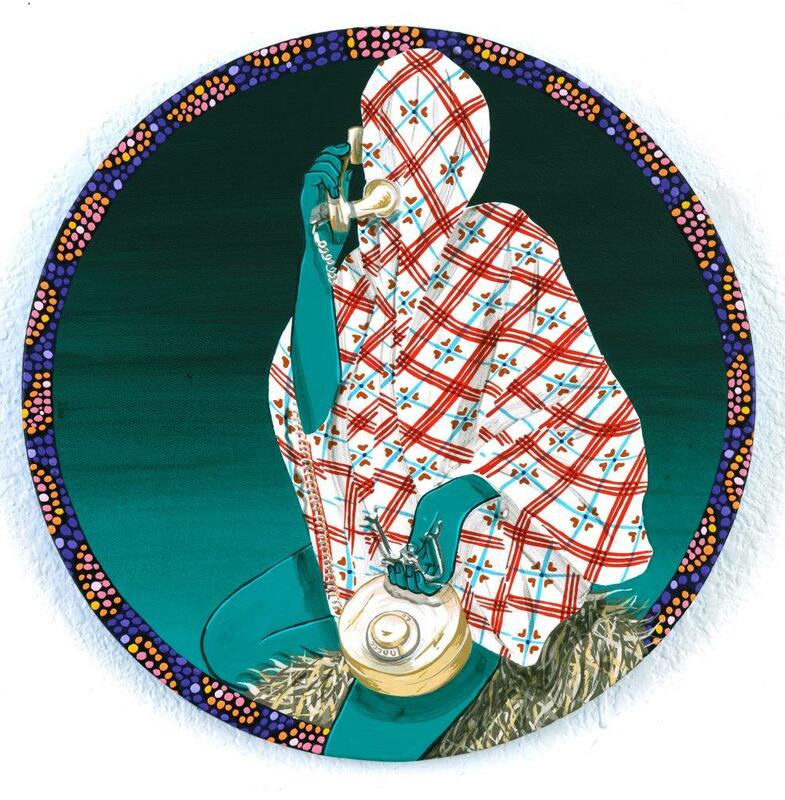 Fallah reinforces the negation of the gaze via ironic perusal of the act of representation, primarily that of the portrait—an overabundant representation in this age of selfie—when he positions his figures opposite mirrors and in situations of self-photography. In other paintings, the figures hold drawings and paintings of others as an ars-poetical signification of the practice of portraiture. 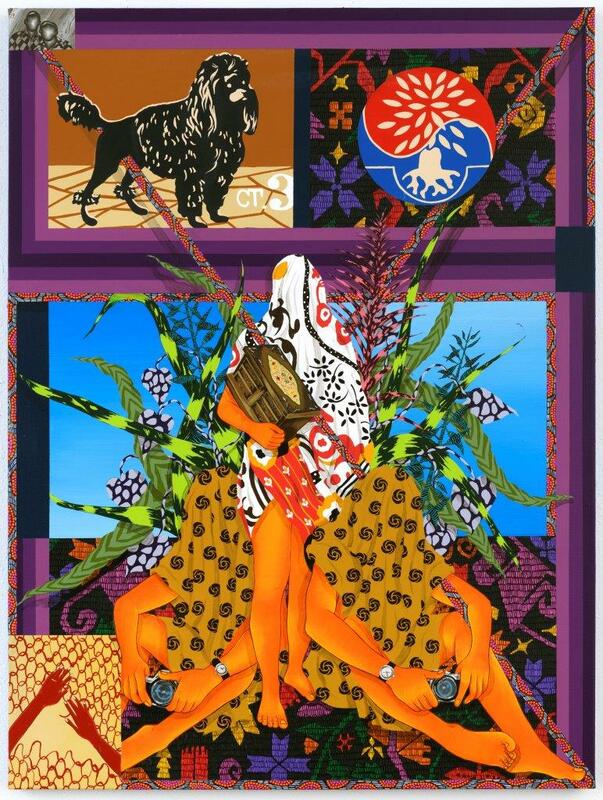 Fallah is inspired by Iranian history and art, integrating numerous allusions to Persian miniatures and ornamentalism in his works, alongside references to the history of Western painting, among them to Renaissance painting and 17th century Dutch painting. At the same time he is also inspired by street culture, graphic design, advertisements, posters, etc. The textiles, objects, and textures in his paintings conceal memories, stories, and histories. They contain the lives of people, where they came from and what they cherish, and these ask to be deciphered by the viewer. "In a way," he says, "I'm trying to take western portraiture and turn it on its head. To deconstruct it and try to create a new way to go about describing someone. In my work, the body becomes a simplified shell on top of which symbolic meaning is literally draped. Since all the materials, objects, and imagery in the works come from my subjects' homes, the paintings become very personal to the subjects. They are visual descriptions of their lives. I try to make connections between the disparate objects they live with. Sometimes these connections happen with formal aspects of objects and sometimes they are conceptual connections." Fallah sets out to furnish portrait painting with another interpretation and a different representation than the prevalent one ascribed to the human face and body. The body as such is, to him, the least significant facet of the depicted subjects. The body's visibility, gender, nationality "doesn’t interest me," he says. "This information is usually superficial and doesn’t get to who someone really is. I'm interested in how the everyday objects that we surround ourselves with describe who we are." As someone who began with graffiti as a child and moved to art studies, the particularly rich coloration of his works revels in the stratification and textural intricacy which the act of painting enables him to put on the canvas, while often using unconventional formats—elliptical, triangular, etc. 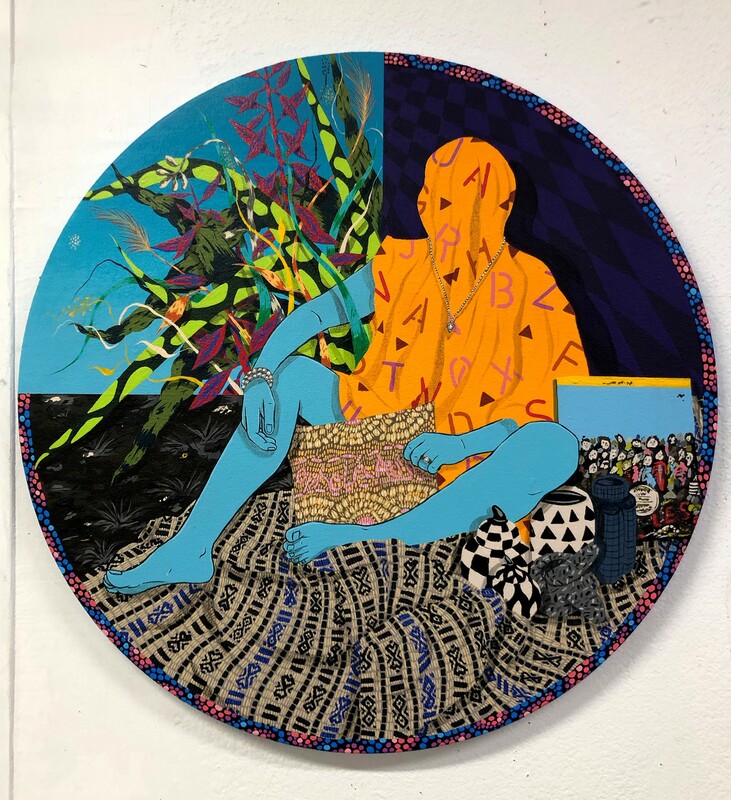 Through painting, he brings the multiculturalism of the various immigrant communities that make up American life today to the fore, especially in view of the rising nationalism of the current American administration. The multicolored hybridity of contemporary life which he presents conceals alienation and non-belonging. Nature in general and botany in particular—a source of inspiration for textiles from time immemorial—are a significant, inseparable part of the visual complexity in Fallah's works. The house plants in his paintings climb and intertwine in the surplus of textiles and objects to become an integral part of the designs and ornaments. Fallah uses them consciously as agents mediating between the inanimate and the animate as they represent nature, albeit a domesticated nature, which is integral to people's homes, to the ability to introduce life into the private sphere. In many of the paintings, however, the vegetation appears wilder and less controlled, as though threatening to take over human culture which constantly produces objects that engulf it and lend it its identity, yet might bury it at any minute. Fallah's intense, seductive paintings confront the viewer with a mesmerizing, dizzying experience which is concurrently frustrating and alienated. Fallah is the archaeologist who excavates and unearths his findings from the piles and debris of contemporary life which take place in a space of continuous excess and aloofness.